Ed Sasnett has been the pastor of Northeast Baptist Church since April 1, 1990. He is a 1980 graduate of Oklahoma Baptist University. In December of 1987, he earned his Master of Divinity from Southwestern Baptist Theological Seminary in Ft. Worth, Texas. He received a Doctoral of Ministry degree from Midwestern Baptist Theological Seminary. Northeast is Ed's third pastorate, previously serving at First Baptist Sharon, Oklahoma and Velma Baptist Church, Velma, Oklahoma. Pastor Ed and his wife Carol have four daughters and 11 grandchildren. All four daughters are married. July 4, 1976 America celebrated its 200th birthday and Ed celebrated new birth in Jesus Christ. During the invitation at the First Baptist Church of Woodward, Oklahoma, he repented of his sins and put his trust in Christ as Savior and Lord. Later, while attending school, he was called by God to the ministry and ordained at FBC Woodward in Nov. 1980. Contact Ed at esasnett@nebaptist.com. Brady has been the worship pastor at Northeast Baptist Church since 2003. He graduated from the University of Central Oklahoma with his bachelors degree in finance. Brady is currently a detective for the Norman Police Department. Brady and his wife Sarah have two boys, Graham and Andrew. Brady grew up as the son of a music minister and was saved at a young age. Music has been a part of his life as long as he can remember. Brady's call to be a worship pastor came at a young age as he led worship for the youth ministry at the First Baptist Church of Miami, Oklahoma. Brady has a passion for leading God's people into worship and has been blessed by God with his ability to curate a worship experience. Born in Ft. Walton Beach, FL and raised in Moore, OK, Rich DeCray has served as a student pastor since 2010. He joined the staff as Youth Minister at NEBC in 2018 and previously served at Mayfair Baptist Church. Rich holds a bachelors degree in music from Oklahoma Baptist University. Throughout his time as a student, Rich remained active in the church before receiving the call to ministry from God. Wrestling with the directive, he finally answered the call as a high school graduate and began actively leading out in Student Ministry. Passionate to see students come into relationship with Christ, Rich provides opportunities for students to engage in fellowship and grow in discipleship. Shane Babcock and his family have been attending NEBC for six years and have been members since 2011. In 2013, Shane began serving as a deacon. His calling to children’s ministry began five years ago when he volunteered for VBS, which led to an opportunity to help with Awana. Over the years, he has continued serving in NEBC’s children’s programs, including as the Sunday School teacher of the 3rd and 4th grade class. His service introduced him to the joy of working with children, and gave him the boldness to share the gospel with people of all ages. 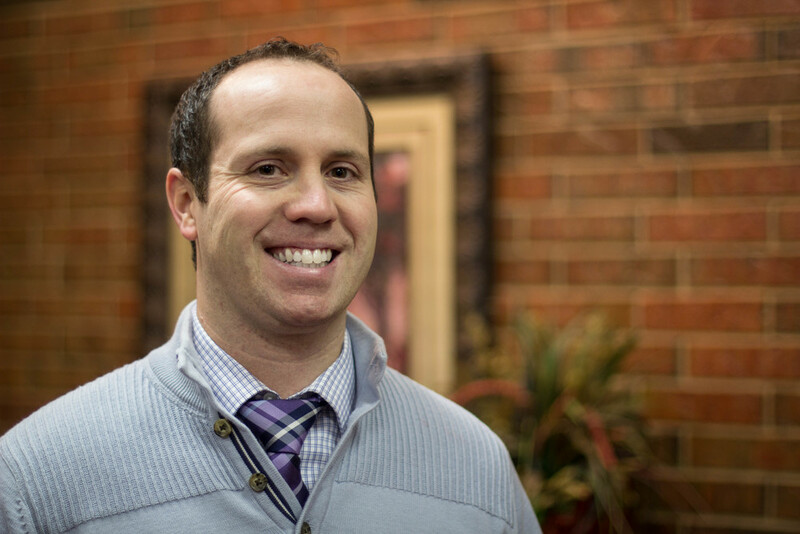 As the Minister of Children and Families, Shane provides leadership for the children’s Sunday and Wednesday programs, including Children’s Church, Awana and summer camps—all with the heart of leading children to seek God and building positive relationships between families and children. Shane is married to Kim, and they have three boys—Lane, Kade and Reed. Shane can be contacted at sbabcock@nebaptist.com. Glenne' grew up in a family of educators and spent her childhood playing school. She benefited from the wisdom and experience of her Christian family and began working in Vacation Bible School at the age of 12. She continued to be active in church during her teens and accepted the call to the ministry while attending Falls Creek. Glenne' received her bachelor's and master's degrees in education from East Central University and earned her PhD in educational administration from the University of Oklahoma in June 2009. This is the third church staff position for Glenne'. She previously served at First Baptist Noble and Faithway Baptist, Norman. She joined the NEBC staff in October 2011. She is passionate for the education of preschoolers and enjoys ministering to young parents and their families. Glenne' has been married for 21 years to Tim and they have two children, Clay and Janae. Contact Glenne' at gwhisenhunt@nebaptist.com.